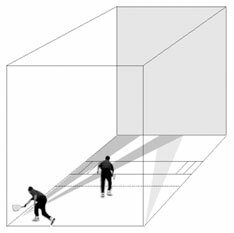 Without exception, the penalty hinder is the most debated call in racquetball. Perhaps this is the reason why most players and officials avoid the call and simply choose to “do it over.” Players abide by other rules religiously, while dismissing the penalty hinder as a discretionary call that is only used in the most egregious situations, if at all. The most common argument is “the infraction was not intentional.” Others will argue that “I gave him plenty of room to hit the ball.” This article will attempt to dismiss the myths associated with penalty hinders and endorse a position where players view this call as a means of ensuring safety and fair play. Section 3.15 of the Official Rules of Racquetball outlines the circumstances under which a penalty hinder would be warranted. For example, the loss of apparel during the rally should justify the call since it creates an impediment on the court. Similarly, a player that fails to allow an unimpeded swing is usually guilty of a penalty hinder. However, other reasons for a penalty hinder are more subjective and require further examination. It is important to note that the rules clearly state, “A penalty hinder does not necessarily have to be an intentional act.” The argument about intention should be dismissed at it has no bearing on whether a penalty hinder should be called. As a side note, this misnomer is one of the main reasons why avoidable hinders were more aptly renamed penalty hinders. Most penalty hinders are a result of court position or the exchange of position by players. A common argument against a penalty hinder is that a player is allowed more than enough room to hit the ball. However, rule 3.15 (a) explains that a player must be allowed a shot straight to the front wall, and a cross-court shot that rebounds to the rear corner farthest from the hitter. If the defensive player fails to move, thereby restricting availability of either shot, a penalty hinder is warranted. It is not necessary for the offensive player to strike the ball for a penalty hinder to be awarded. The defensive player should be aware of his position and inclined to give the offensive player the call in order to preserve safe play. It is in the defensive player’s best interest to allow the call when warranted so his opponent will not feel it is necessary to hit around him. This posture of sportsmanship initiated by the offending player should promote a safer game. Blocking an opponent’s access to a ball is also grounds for a penalty hinder. Contact between players, especially in doubles, is expected. Whereas inadvertent contact usually results in a replay hinder, intentional contact by the offensive player resulting in a distinct advantage could prompt a penalty hinder. Moreover, it is incumbent upon the offensive player to yield position after hitting the ball, thus giving access to his opponent. Players that hit the ball back to themselves are often guilty of this infraction, and should not be rewarded by an opportunity to replay the point. There are other situational issues that may affect the call of penalty hinder, such as diving and jumping. Players caught on the floor after diving that clearly obstruct a required shot are guilty of a penalty hinder. However, players jumping to avoid a required shot may not be guilty – it is discretional based on the height of the shot, and the height and timing of the jump. Doubles play introduces more factors for consideration, but do not change the underlying premise of a penalty hinder. It is easier to think of a doubles team as one unit for the purpose of rule interpretations. As previously mentioned penalty hinders are subjective and require a good understanding of rules and court positioning. It is important to note that the difference between replay hinders and penalty hinders are often minor, hinging on the discretion of the players or official. The CRA recommends that players consult the official rulebook (available on the CRA website), and attend a local rules clinic for case studies. Meanwhile, consider the benefits of extending a penalty hinder call to your opponent – you will find the game is safer, and encourages improved court position.